Michigan is a state full of Amish settlements, with over 40 as of 2016. Amish are traditionally farmers, but many have branched out into construction, with businesses providing roofing services, among other trades (like masonry or carpentry). Below, a few of the Amish roofing businesses you’ll find in Amish communities across the Wolverine State. Amish roofers and builders typically travel up to 2 hours in one direction for work (by using hired drivers). 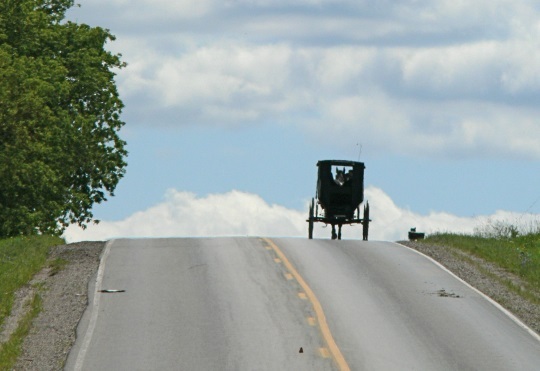 The most conservative Amish do not travel by vehicle except in an emergency (but this is a small minority of the total Amish population). Note: The following companies are a sampling of Amish businesses doing roofing in the state of Michigan. Some may offer other construction-related services as well. Services and businesses may change, so please confirm using the contact info below for current information and details on roofing estimates, availability, etc. You can find Amish contractors doing a variety of roofing work, including metal roofing, roof repair & replacement, tile roofing, storm damage repair, slate roofing, wood roofs, and more. You can also check the main directory of Amish roofers including companies in states such as Indiana and Ohio. The Amish community near Charlotte is within close proximity to the cities of Lansing and Battle Creek. Since Amish frequently travel up to 2 hours in one direction for certain jobs, roofers in this area could conceivably take on projects in other Michigan cities, including Grand Rapids, Kalamazoo, Ann Arbor, and Flint. Roofers in this area are within range of Michigan cities including Grand Rapids, Saginaw, Muskegon, Mt. Pleasant, Midland, Traverse City, and Flint. Osceola County in north-central MI is home to 6 distinct Amish communities. One can be found in the area of Hersey. Home improvements, Roofing, Siding, Windows, Decks, Pole barns. Montcalm County, also in north-central Michigan, is the location of 3 separate Amish settlements. The community at Six Lakes and Greenville is the oldest, with around 500 Amish residents. 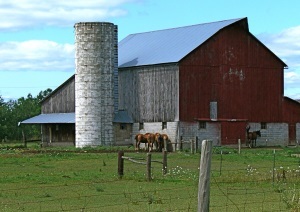 An Amish barn in the area of Roscommon in northern Michigan (Roscommon County). The Clare settlement was founded in 1981, and is home to approximately 500 Amish. In 2012 the Clare community hosted the Horse Progress Days event, a showcase of horses and horse-drawn equipment popular among Plain people. Stutzman’s is a seller of metal siding and roofing material. Two of the main challenges you might imagine Amish roofers face are: transportation, and how to power their tools. For the first matter, Amish roofers will either hire a driver, or have a non-Amish person as a worker, who is able to drive either a personal vehicle or a company vehicle like a work truck. This arrangement is acceptable in the majority of situations. It’s well-known that Amish do not use public electricity. So what about power tools? In their at-home workshops (for example, in furniture makers’ shops), Amish use previously-electric tools which have been adapted to run on pneumatic and hydraulic power. But when they are working away from home, they need to be able to use conventional tools as they lack the pneumatic/hydraulic power source. So Amish roofers (and builders for that matter) typically use standard tools which they simply plug into conventional power sources available at their non-Amish customers’ homes. Amish may also use generators to create power for such tools if necessary. Are you an Amish roofer in Michigan, or do you know of one? Add your details in the comment section below.